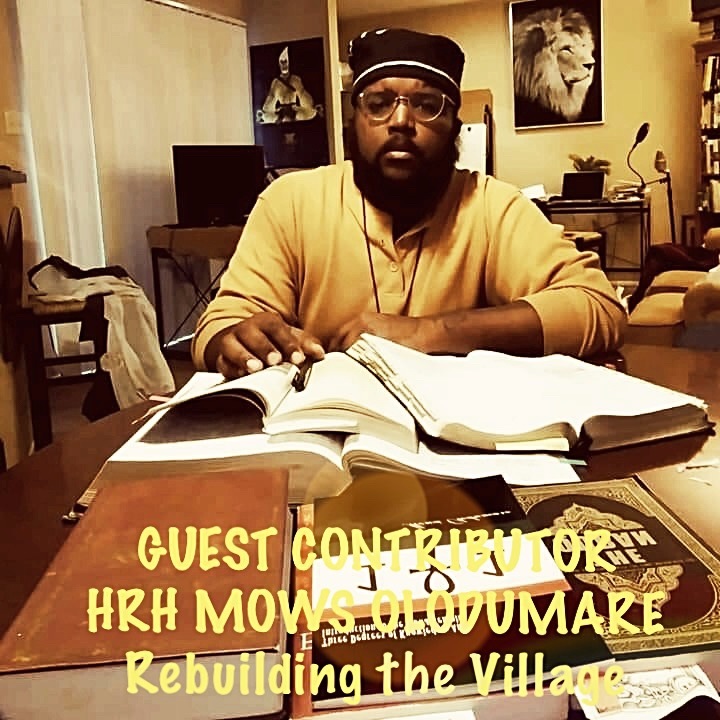 Guest Blogger: HRH Mowa Olodumare "Rebuilding The Village"
As we creep upon the end of Black History Month, I ask my people not to be enslaved by History. Our Ancestors didn’t live their lives so that we can only remember them, but to also become inspired and carry the baton farther for future generations. I ask my people, as we continue to learn about the greatness of our Ancestors from Africa that we do not exclude Our Ancestry here, in America. Our experience in America has made us unique people! Nobody on the face of Earth has been challenged the way that we have! No other people on Earth have had their name, culture, religion, and families ripped from them. No other people has been described by law as 3/5ths of a Human being and fed self-hatred along with chitterlings and livers! My Brothers and Sisters, through this pain, through this forced ignorance, Our Ancestors, here in America, risked their lives by candlelight to decipher these letters that I write, and you read today! The longing of Knowledge and Understanding around Us made Us into children of the Enslaved who still developed cities, created inventions, and wrote Poetry that would give Harlem it’s swagger! Brothers and Sisters we have grown from perceived inferiority into the reason the lightbulb is perfected, traffic is organized, lives are saved due to the storage of blood. The prosperity of America is due to Our Intelligence, Our Perseverance, and Our Resolve! But, let us not be amazed of our feats of History, because as the Children of Giants we must now leap from their shoulders to reach new heights and discover new skies. My Brothers and Sisters, we must Self-Reflect on our lives. We must assess our current condition and ask ourselves if this is where we want to be. We are the accumulation of our decisions and our decisions can be rooted in the fertile ground of great examples or barren ground of great examples of what you don’t want your life to be. We must break down the walls of division between Us to give and receive the talents necessary to rebuild Our Village that once raised and developed Us. We must no longer share the worst of our communities as entertainment for the world, instead, we must recognize the dysfunction within our communities and correct them. We must recognize that no nation rises above its Women, as said by the Honorable Elijah Muhammad. We must recognize Our roles as Men and Women, we both have an important role to play in the rebuilding of Our Village. My Brothers and Sisters, we must embrace Our differences while maintaining Our Humanity. We are not all Christian, We are not all Muslim or Jew. Some of Us are Atheist, some of Us are Homosexual, some of us are Republican, and Some Democrat or Independent. Our differences are the mosaic that makes gives Us Our Rhythm, Our Flair, and Flavor! Yes, disagreements between these groups exist, but we must remember our Humanity first, so when Our Community needs Our Unity, we can pause the disagreement for the sake of the Whole. When A Brother or Sister is molested by the corruption of society, We must see Our Brother or Sister, before We see their chosen identities. We have no time to be divisive over trivial matters. We don’t have to like everyone in our community, but We must Love each Other enough to Unify when a Unified Front is needed. Black History is not meant to be a relic gazed upon. Instead, it is meant to be a springboard for The Black Present and Future. Let Us be inspired by Our feats and Let Us learn from Our mistakes so Our Children will know from Us what it means to be Black and what it means to Rebuild Our Village.